A guardian is someone appointed by the Court to assume legal responsibility for another person or another person’s property or both. Guardianship is appropriate when a disabled person, known as the ward, is unable to make responsible decisions concerning his or her medical care or financial situation, usually because of a physical or mental illness. 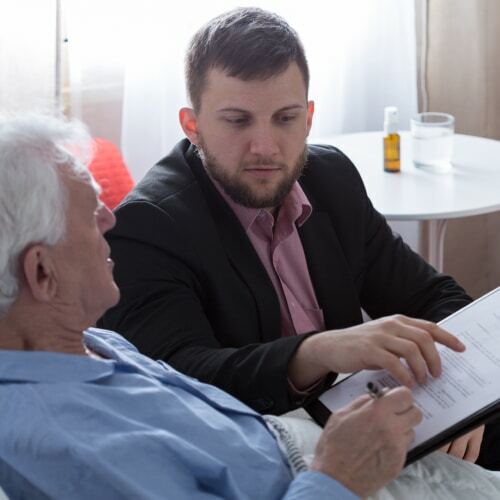 Sometimes guardianship may be necessary to obtain consent for a specific medical procedure, for continuing ongoing medical care or for placing the ward in a safe living environment. Guardianship may also be appropriate for a minor. Maryland law establishes a priority of individuals eligible to serve as guardians. The first priority candidate is someone designated by the ward before they became disabled; next are blood relatives and individuals who have a particular interest in the person, such as the director of the local social services department or office on aging. An individual with higher priority may be passed over and one with lower priority appointed guardian if good cause is shown. In all instances, a petition must be filed with the Circuit Court in the county where the alleged disabled person resides, is hospitalized or is located. The petition should state all reasons for the appointment of a guardian and whether the request is for guardianship of the ward’s person, property or both. Quite often, guardianships of person and property are sought in the same petition. the name and address of the ward’s attorney if he or she has one. After the petition is filed, the Court will sign an Order requiring the ward, his or her attorney, and any other interested person or agency to respond to the guardianship request within 20 days. The ward and any interested person or agency must be notified of the guardianship proceedings and his or her rights at the proceedings. The court will appoint an attorney to represent the ward and may appoint an independent investigator to look over the facts of the case and report written findings to the court. The court will also schedule a hearing or jury trial, where a judge or jury decides whether guardianship is appropriate and who should be appointed as the guardian. Usually, the judge decides the validity of the guardianship petition, but the Maryland Rules of Procedure provide that a jury trial is available unless waived. As a practical matter, a jury trial rarely occurs because the ward’s attorney often agrees that guardianship is advisable, and their client usually is unable or unwilling to object. When a jury trial is held, it is governed by the rules of evidence, which determine what information may be introduced during a formal hearing or trial. All interested parties may participate in the trial at which the judge or jury appoints the guardian and establishes his or her responsibilities to the ward. What is the Duty of a Guardian After Appointment? Once named, the guardian has a duty to act according to the Court’s instructions, which are usually set during the guardianship proceeding. If the court grants guardianship over the ward’s property, the guardian has a fiduciary duty to manage the ward’s assets properly. The law requires that the guardian of the property file an annual accounting with the Court detailing the financial transactions of the previous year. An individual known as a trust clerk reviews this accounting, done on forms available from the local clerk of the court, for compliance with the court’s instructions. The guardian of a person is responsible for making health care decisions and assuring that the ward is living in a safe environment. The guardian of the persons must file an annual report detailing the ward’s status, the care plan and whether the guardianship needs any changes. Is it Necessary to Hire and Attorney to File for Guardianship? Guardianship proceedings can be handled without an attorney, but the procedure is often complicated. Hiring an attorney to represent the petitioner can ultimately save time and expense while ensuring a result that is in the best interest of the ward.